Fisher Stolz studied in Cortona, Italy, where he later returned for a semester as faculty. Similarly, he retains the demeanor of a true southern gentleman, a reminder of his birth and his time spent at the University of Georgia. Fisher is always aware of the point when his work comes alive. It takes on a personality that he simply follows. “Momentum” is a metaphor for life and the creative process. The appearance of forward movement and rotation taken together remind us of our own efforts that often seem like we are taking “one step forward and two steps back.” Momentum contrasts fluid curves and hard edges, and provides various surface textures for emphasis. 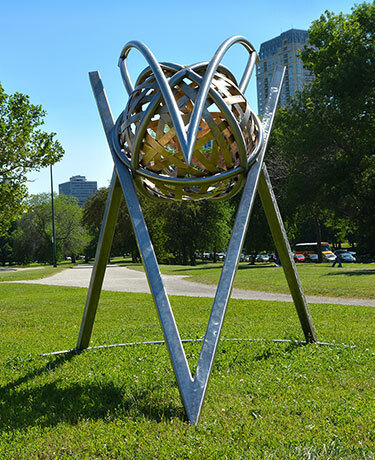 The negative space speaks as loudly as the sphere shape with its random, energetic bronze pattern. This is quite intentional.